One was his annual list of goals that he writes every Jan. 1 during quiet time on the beach, some of them golf specific, some of them about life. He tacks the list in the middle of his closet so he can’t miss it when he’s getting dressed, packing for a trip or getting his watch and wallet. 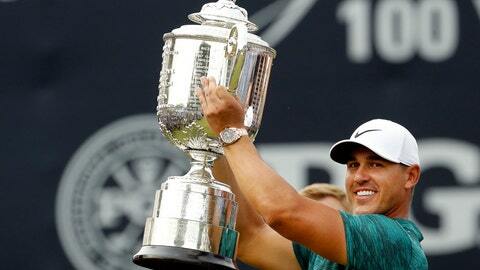 “I’m definitely ahead of schedule on certain things,” Koepka said Tuesday. His left wrist was bothering him last December in the Bahamas, where he finished last in an 18-man field, 21 shots out of the lead. A month of rest didn’t help. He started the new year at Kapalua and finished last in a 34-man field, 37 shots behind. “It was too long for me to quote it exactly, but it was to wake up every day and find the positive because you were one step closer to being you, and to enjoy the moments of frustration because with each step you get better and better, and to embrace those moments,” Koepka said. Koepka leaves this weekend for the start of a new PGA Tour season, even though the year isn’t over. He is playing the CJ Cup in South Korea, followed by the HSBC Champions in Shanghai, and then his title defense at the Dunlop Phoenix in Japan the weekend before Thanksgiving. “I’m heartbroken,” he said at St. Andrews for the Dunhill Links Championship. Johnson was at The Bear’s Club when Koepka won the Jack Nicklaus Award, and they made a short video poking fun at the fight before Johnson congratulated him on winning player of the year. “I’ve got one of these, too,” Johnson said. “Well, this bad boy’s mine,” Koepka replied. Getting another one will be no small feat if Koepka chooses to put that on next year’s list. Thomas and Johnson won three times and took turns at No. 1. That doesn’t trump two majors by a guy who spotted the field some four months.